Stocks bounced between 1,980 and 1,965, but spent most of the day in the red and finished in the middle of this range. Volume was above average and the highest we’ve seen in a couple of weeks. We were having a good morning until Janet Yellen started speaking to Congress. From there we plunged more than 15-points as she shared her views of a fragile recovery and asset bubbles in the market. That was enough for some traders to hit the sell button and send the market lower midday. To figure out where we go from here we need to understand who was selling, buying, and holding this move. It really doesn’t seem like Yellen shared anything new in her testimony, so fundamental traders are unlikely to change their outlook based on what she said. That means most of the activity came from reactive traders responding to the negative commentary and technical/momentum traders selling the weakness and dip under Monday’s close. But following the initial wave of reactive selling, supply dried up as a wider group of owners chose not to join the liquidations. This group held through multiple conflicts in the Middle East and Easter Europe, brushed off Portuguese bank defaults, as well as every other bearish headline to hit the wires recently. From that frame of reference, it seem unlikely Yellen stating the obvious would convince them to sell today either. Holders keep holding and until something changes, expect the resulting tight supply to prop up prices. Today’s volume was elevated as reactive traders dumped shares, but those buying the discount showed a willingness to jump in front of these headlines and weak price action. If these dip-bueyers are more confident than the reactive sellers they replaced, expect supply to get even tighter in coming days. Swift selloffs are swift and holding 1,950 for four days is anything but swift. If we violate support near 1,950, that means we ran out of dip-buyers and there are few things that rattle nerves like a screen filled with red. Breaking technical support could trigger a larger wave of stop-loss selling and send us to 1,925. We are stuck in no-man’s land between recent highs at 1,985 and lows at 1,950. Holding last week’s bounce for another day show buyers and owners are comfortable with these levels and we exhausted the supply of sellers. 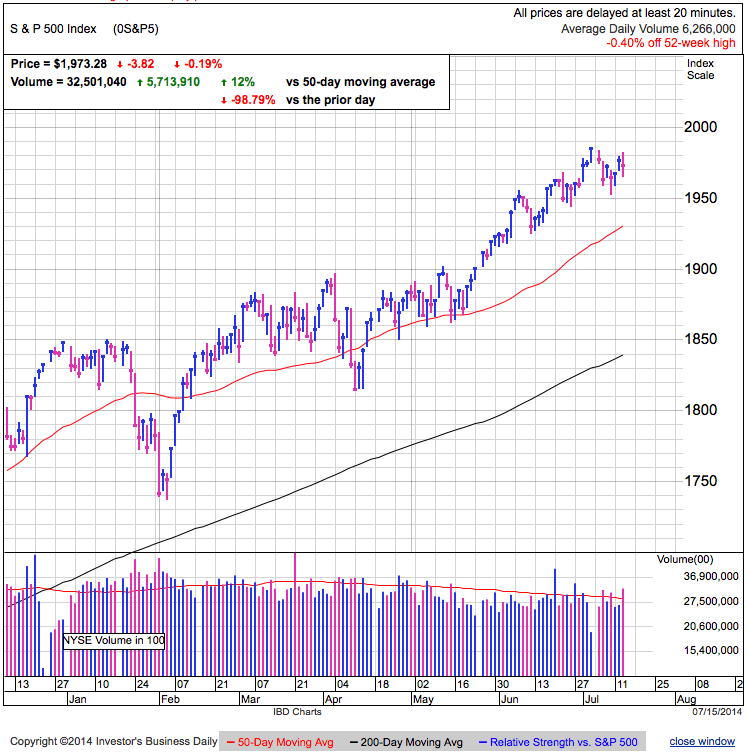 But fail to hold 1,950 on Wednesday makes a test of the 50-dma likely. Plan your trades accordingly.